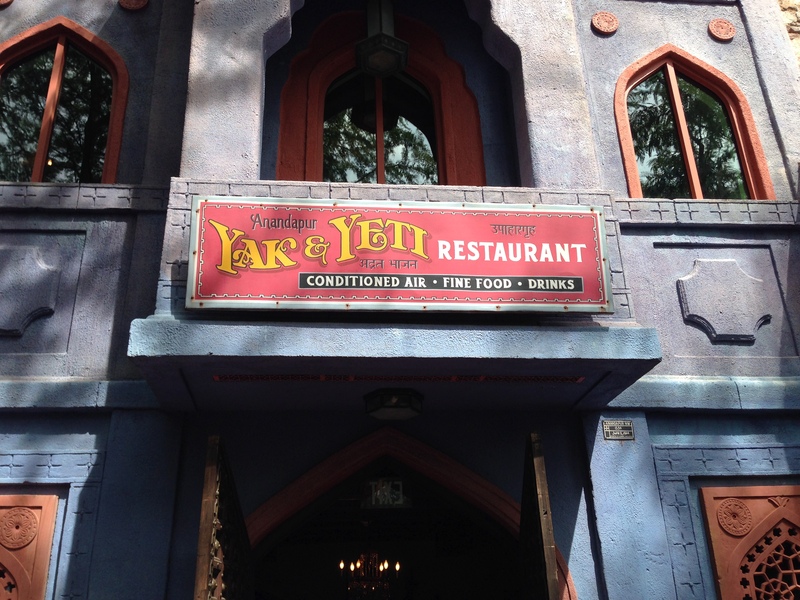 Dining Recon: Yak & Yeti Restaurant | It's "All in WDW"
Did you try your hand at yesterday’s “Table Service Trivia”? How’d you do? 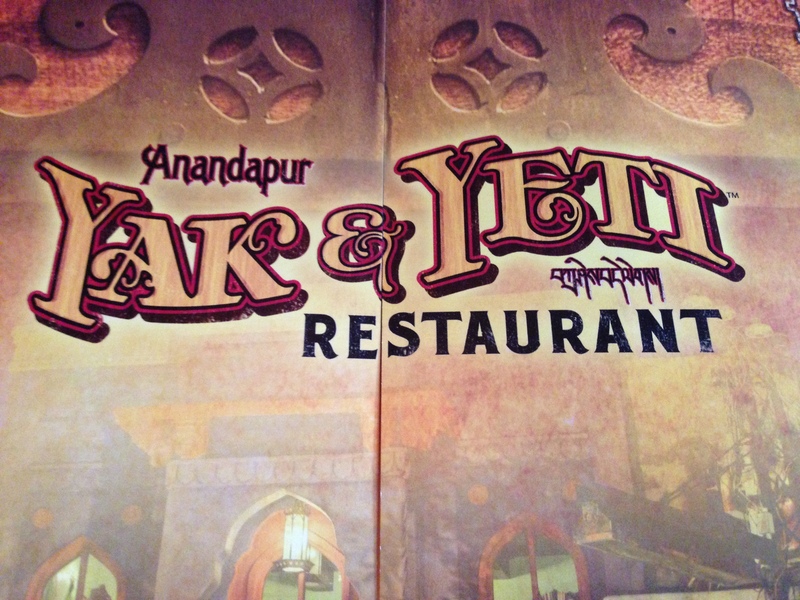 Did you know that our rich merchant built a hotel that includes the Yak & Yeti Restaurant? “Your path to discovering Yak & Yeti begins at the foothills of the Himalayan Mountains, a major crossroads of cultures. The majestic sight of Mount Everest is just above the horizon. Traders, pilgrims, and armies have passed through this small, rural kampong, or village, on a well-travelled road to India snaking through China and Southeast Asia. Here in the town of Anandapur lives a rich merchant, Arjun, who has fallen on hard times and has turned his large home into the Yak & Yeti Hotel. The hotel is the kind of boutique hotel that wealthier adventure travelers might seek out in India. 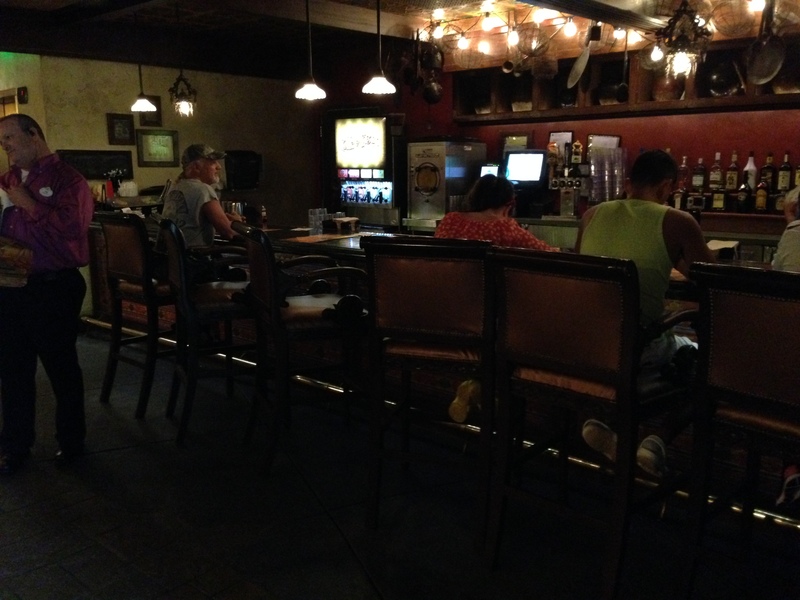 While travelers rest at the hotel, the owner and other families reside there. 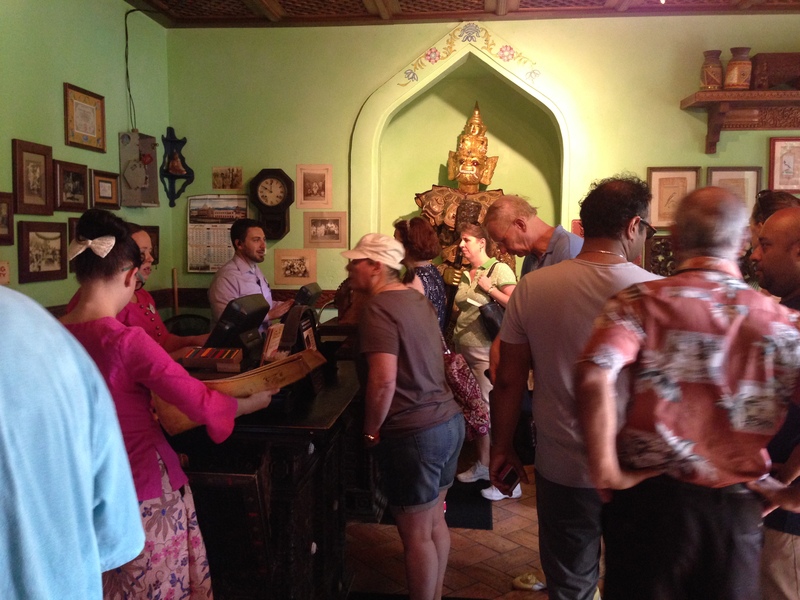 The decor, as well as the furniture, at Yak & Yeti is an amalgamation of mismatched artifacts Arjun has collected through his years of travel in Southeast Asia. 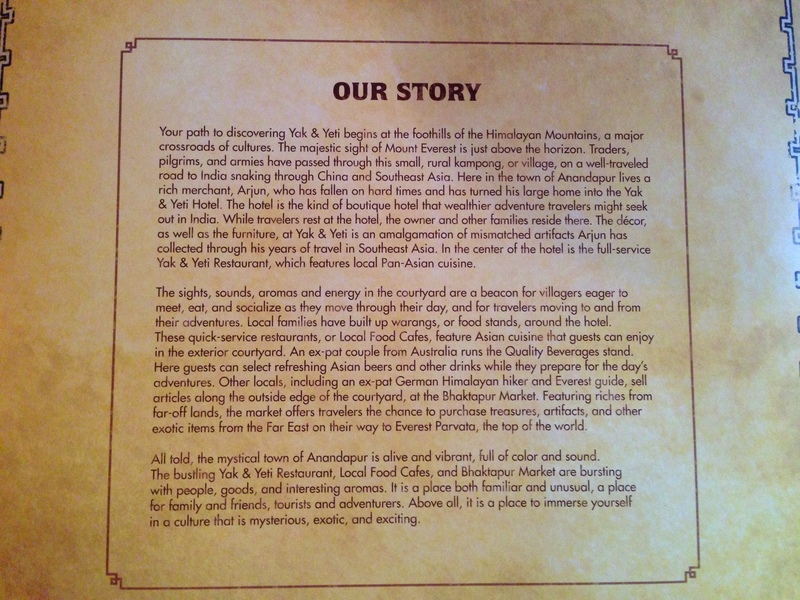 For the full scoop, check out the back of that menu! 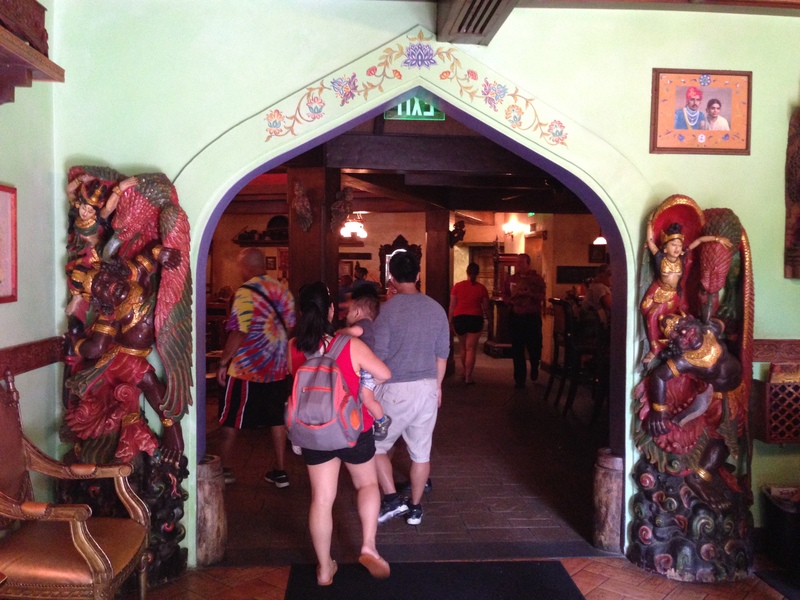 Then, take a tour through some of the Yak’s decor and, more importantly, their food! Enjoy and bon appetit! It was quite a crowded day! The bar area. Few seats but fun. The dining room is roomy but the furniture is kind of plain. You can see some of Arjun’s “artifacts” on display. 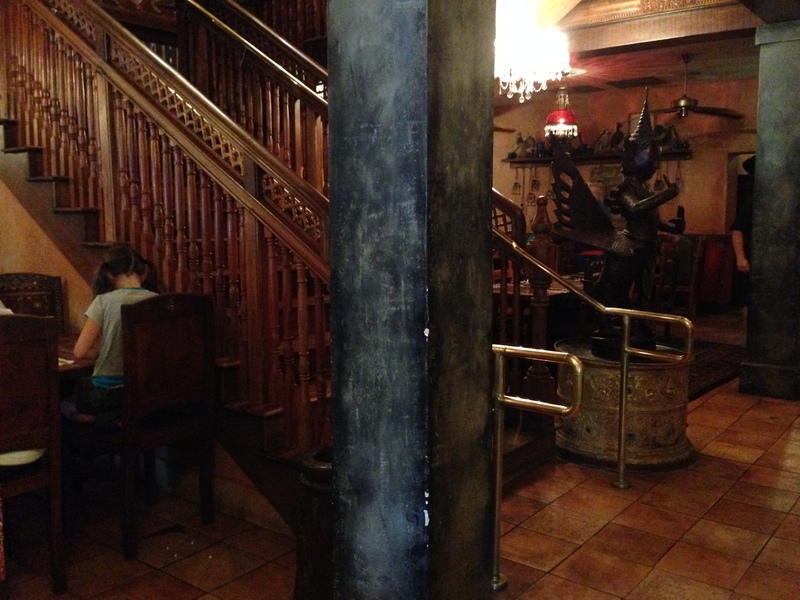 There is upstairs seating, but we didn’t get to take a look. Mrs. All in WDW and I were, actually, there to meet with friends. Therefore, my photo tour was somewhat limited. Having said that, we did get the important stuff … the cuisine! We shared Wok-Fired Green Beans for an appetizer, for example. 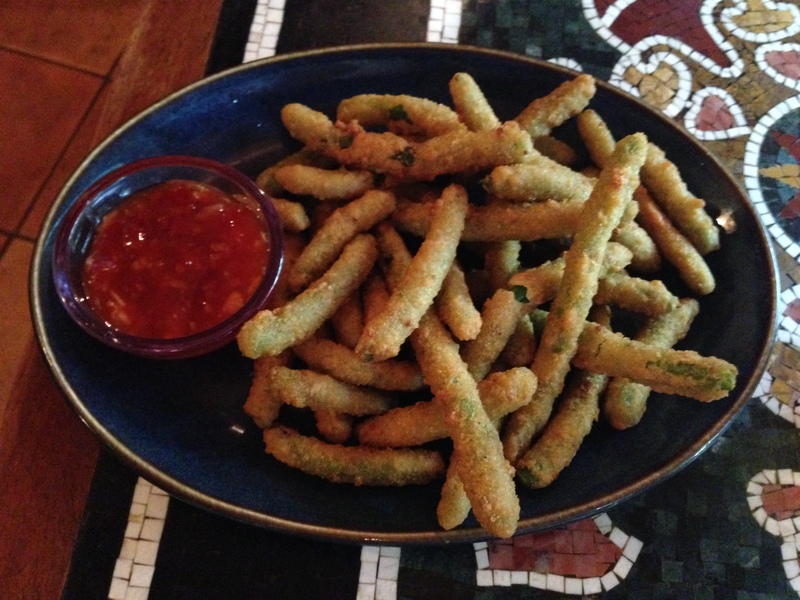 These were very well-battered green beans with a deliciously sweet Thai chili dipping sauce. Yum! 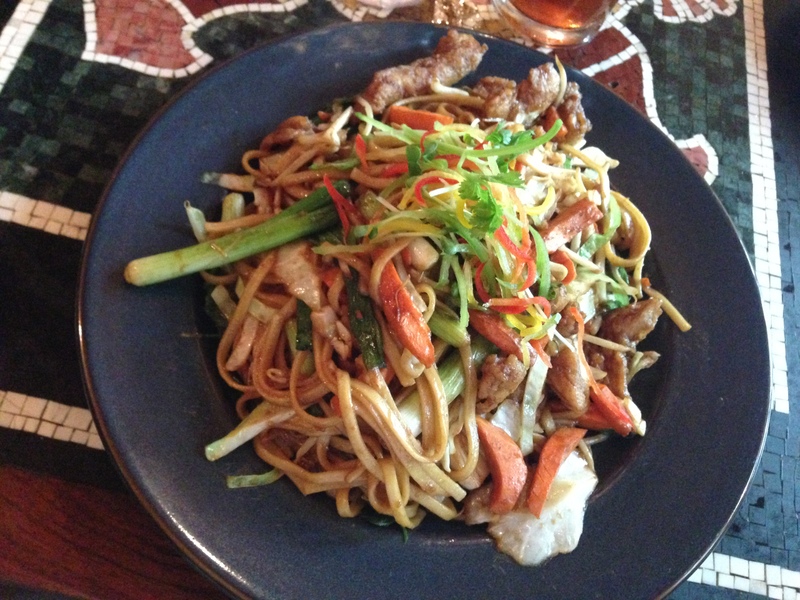 For an entree, I had Lo Mein – Chicken. It was very good and included Lo Mein noodles, carrots, cabbage, green onions, bean sprouts, and, of course, chicken. 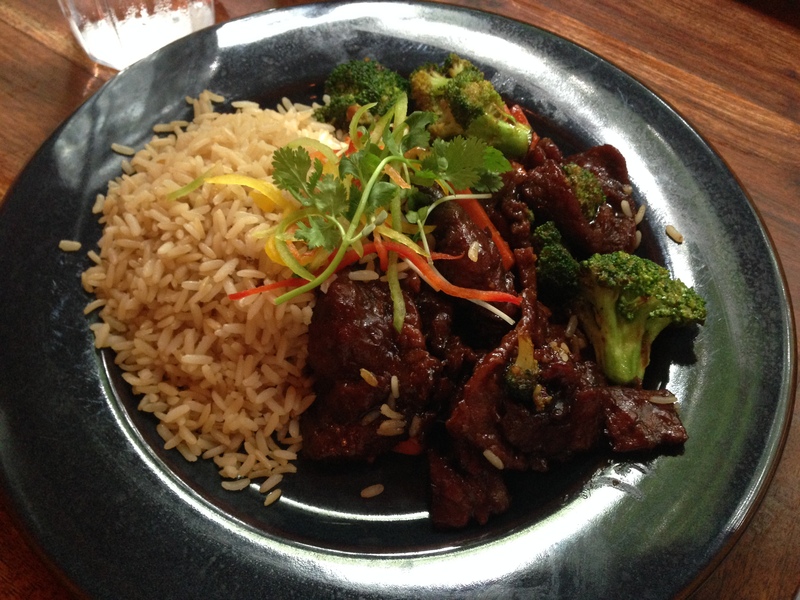 Mrs. All in WDW ordered a stir-fried beef and broccoli dish that, sadly, doesn’t seem to be on the Yak’s menu these days. It’s too bad. Simple as it was, she really enjoyed it! 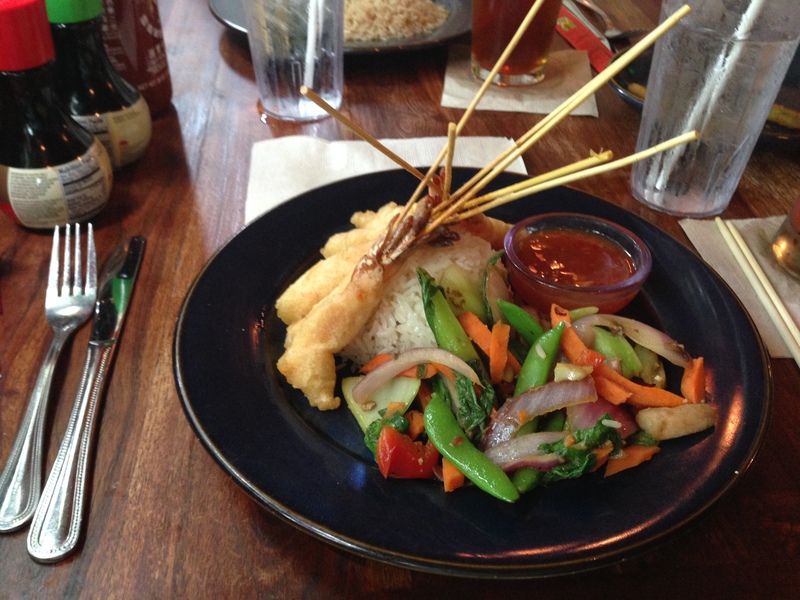 One of our friends chose Tempura Shrimp with chili plum sauce, jasmine rice, and stir-fried vegetables. A very attractive presentation! It was also something he’d had before. It was good enough to desire an encore serving, I’ll tell you that much! Finally, the last member of our quartet selected Crispy Honey Chicken. The current price for these entrees rests in the $19 range. A bit costly, in my mind, but you’re paying for the restaurant’s “legend” and decor. And, plus, it is Disney. Food’s supposed to be expensive, right? All in all, we had a good time with friends. 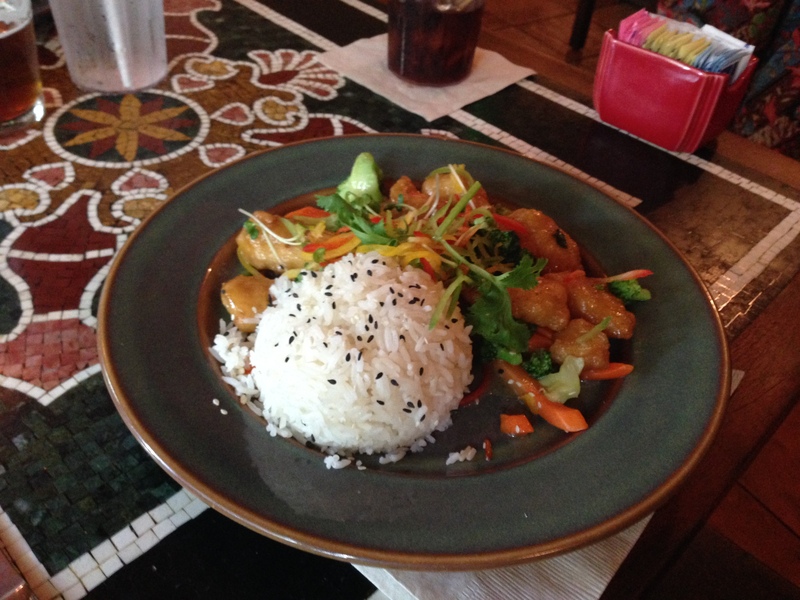 We experienced some tasty dishes and enjoyed our visit. You should stop in and see Arjun, my friends. He’ll treat you right! Bonus Coverage! MORE Food! 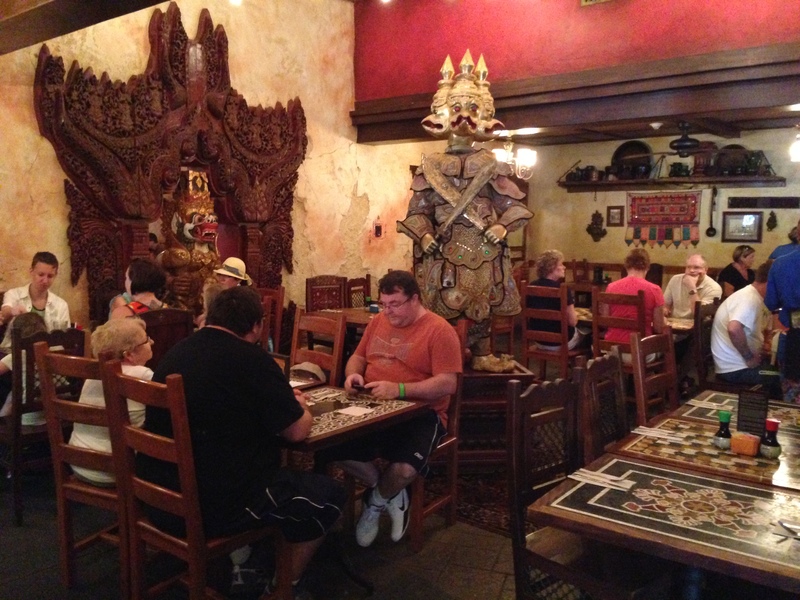 All in WDW’s thanks go out to Kelli Kopaczynski‎ for this additional contribution! 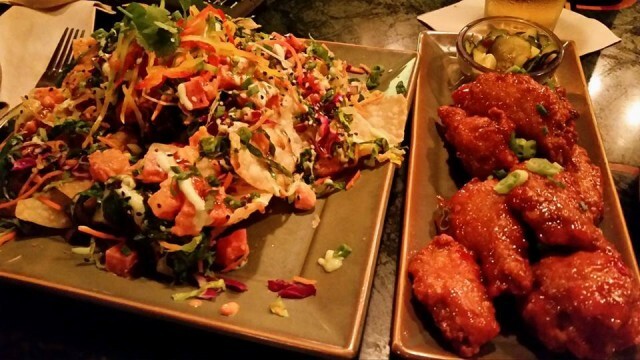 The “nachos” are made with sushi grade ahi, Asian slaw, crispy fried wontons, wasabi aioli, and a sweet soy glaze. The chicken wings are fried and tossed in a sweet Thai chili sauce. They are accompanied by spicy Asian pickled cucumbers. Yum! ← Table Service Trivia! Huh?